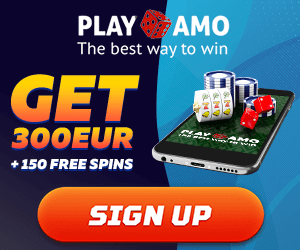 PlayAmo mobile casino is certainly among the most appealing ones to visit, especially if you are considering a new gambling hotspot to join and try your luck at. Known for its immense promotional and bonus action, PlayAmo brings forth the full might of a gambling brand that cares about its players and their preferences. It’s really no wonder that this Curacao licensed casino has so much appeal to it and players raving about their experience all across the internet. PlayAmo casino for mobile players is the adaptive kind, with the site design changing to adapt flexibly to your device, rearranging the elements on the page to make navigation easy and enjoyable. No matter if you are using a smart phone or a tablet, your PlayAmo experience promises to be just as great – with you having access to each and every game available to desktop players. Mobile players get the same bonuses as everyone else, with no special offers of any kind. It won’t be an exaggeration to say that PlayAmo has one of the busiest promo calendars out there – as there is something to do on any given day. You are started off with the casino’s welcome bonuses that in total can give you up to €300 in cash. There are a total of two welcome bonuses, the first one being 100% up to €100 and the second one – 50 % up to €200. You also get 100 free spins with the first bonus and 50 with the second one. Each bonus is activated as soon as your deposit clears, and the wagering requirement is x50. Besides this warm welcome you can score free spins every Monday (up to 100) and up to €250 + 50 free spins every Friday – in both cases you need to make a deposit on that day. Additionally, there is a regular promotion for slot players and another one for table game players – which is quite uncommon to come by, which makes it particularly interesting and potentially lucrative if you enjoy the good old blackjack or roulette. PlayAmo has a truly impressive choice of slots to play – 2,500 and counting, as new ones get added every now and then. In general you should see every single gaming provider familiar to you on their roster, as this casino does its best to keep their collection of games constantly expanding, following the latest trends and adding the latest releases quite regularly. All slot games come in crisp quality and feature plenty of opportunities to earn extra cash or free spins. The live games available at PlayAmo deserve a special mention – there is an entire category for those. Even though live games revolve around the three most popular ones – roulette, blackjack and baccarat, there is plenty of variety among those. With plenty of tables to join at any time and a generous choice of handsome and beautiful croupiers, every player will find something to their liking. How to open an Account with PlayAmo via mobile? You cannot miss the SIGN UP button on the casino’s website – clicking it will open a pop-up window. In that window you will need to enter you e-mail, come up with a password, pick currency, and country of residence. You also have boxes to check – if you wish to receive promo offers, SMS promo offers, as well as to confirm you are of legal age. After you press SIGN UP, an activation email will be sent to your email address, and after that it just comes down to clicking on the link and logging in. PlayAmo is a highly regarded online casino that you will enjoy playing at. Offering high level of security and convenient navigation to all mobile players, this casino is a safe bet if you enjoy comfortable playing on the go. If you like our article and would like to receive special Mobile Casino BONUS offers, please sign in to our newsletter here. We are committed to responsible gaming. We see online gambling as a legitimate form of entertainment that is enjoyed by millions of our customers worldwide. However, while most players share in our fun and excitement, we realize that a small percentage of visitors might be underage or might have allowed gambling to assume too large role in their life. Gambling is not legal in some countries. Before starting online gambling please check the law with your local authorities. Being a responsible mobile casino portal we are doing our best to comply with applicable laws and regulations of gambling friendly countries, especially UK, so feel free to report anything you find inappropriate on our site and we will immediately review it and take actions. Copyright © 2011 - 2019 top10mobilecasino.com , All Rights Reserved.